From 8 April 2019, motorists driving in the London’s Congestion Charging zone will be subject to a new additional daily charge. 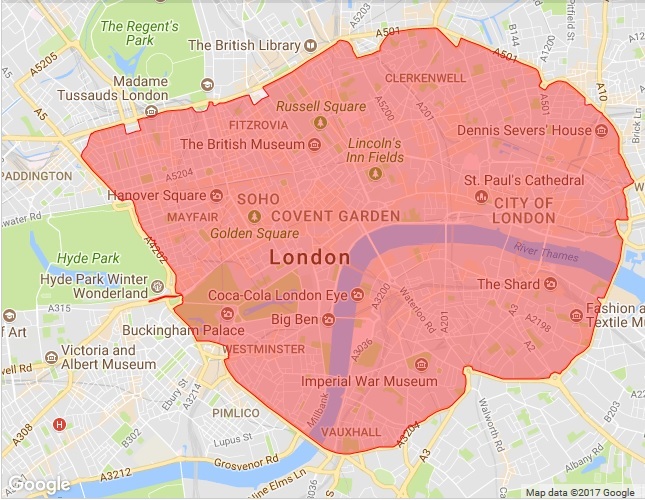 In a bid to push forward with the promise to improve air quality, an Ultra Low Emission Zone (ULEZ) will be in place with vehicles needing to meet new, tighter exhaust emission standards (ULEZ standards) or pay a daily charge to travel in the ULEZ. The ULEZ will be in operation 24 hours a day, 7 days a week all year round including weekends and public holidays. This new charge replaces the T-Charge but is in addition to the Congestion Charge and Low Emission Zone (LEZ) charge. The ULEZ rules will be applicable to most vehicle types, including cars, motorcycles, mopeds, motorised tricycles, quadricycles, small vans, large vans, 4X4 light utility vehicles, motorised horseboxes, pickups, ambulances, motorcaravans, minibuses, lorries, buses, coaches, breakdown & recovery vehicles, snow ploughs, gritters, refuse collection vehicles, road sweepers, concrete mixers, fire engines, tippers and removals lorries. The charge starts from £12.50 per day but will vary depending on your vehicle. Transport for London (tfl) have provided this easy-to-use ULEZ vehicle checker tool for all motorists to clarify whether or not the new ULEZ will be applicable to their vehicles – simply enter your registration number. The area covered by the ULEZ will be expanding from 25 October 2021 and will cover the inner London area bounded by the North and South Circular roads, a map of the zone extension has been shared by tfl to help motorists plan ahead. We are here to help and answer any queries you may have, reach out to Balgores Leasing on 01708 38 44 51.